This is a joint giveaway with African Babies Don’t Cry and Natural Parents Network. You may enter at one site only. Please find the section marked “Win it!” for the mandatory entry and optional bonus entries. Andrea Olson of EC Simplied is offering our readers a giveaway of her EC Simplified: Infant Potty Training Made Easy Plus Package, with a value of $47. The Plus Package includes the information-packed eBook, audiobook, access to a private forum, access to the video library and access to the tool library! I had a very relaxed introduction into natural parenting, and I came upon Elimination Communication rather late in my son’s life. I was totally intrigued. Imagine! No more diaper laundry! However, information on the topic seemed difficult to come by, and EC remained that mythical practice left only for those ‘ultra-crunchy’ wise mothers who know everything. 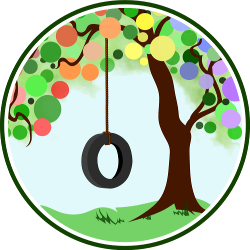 Even later in my parenting journey, I happened upon Andrea and her site EC Simplified. I sent her a message, asking if it was even worth giving her book a read as my son was already 18 months old. She assured me that her book could help me with early potty training, which I was super excited to try. I am so glad I did, because six months later my son is completely diaper free and dry during the day and night. Elimination Communication (EC), also known as infant potty training, is a gentle, non-coercive way to respond to a baby’s natural pottying needs from birth, which enables her to follow her instincts to not soil herself, her caretaker, or her sleep space. Elimination Communication works with the ancient knowledge that a baby is born with a certain amount of control over their bladder and that they will happily co-operate to learn to become totally potty independent. Andrea became interested in EC when she was pregnant, but she had such a difficult time trying to learn about it that she almost gave up. With this in mind, she started researching and writing the most user-friendly and information packed book on EC available today. Even seasoned EC’ers will enjoy Andrea’s book and are sure to learn a thing or two. With the plus package you receive the book and the audio files, so, depending on whether you are a visual learner (like myself) or prefer to listen to the audio files whilst cleaning the house, cooking or traveling, there is an option for everyone. The book is written in an informal, chatty tone which sets you at ease straight away and makes you feel at home with Andrea. In her own words, Andrea wrote this book backwards, delving straight into the how-to and only at the end going into the interesting bits such as the history of EC, etc. As she says, “I put the juice first,” so that all of us pregnant or otherwise busy moms can get to the important stuff first. The layout of the book is wonderful, with pretty flowcharts and tons of full colour pictures illustrating all the different positions, places and ways you can go about EC. I am disappointed there isn’t a hard copy of this book available, because, well – I just love books! But, Andrea has made this eBook fully interactive, with links to downloads, photos, and a fully clickable table of contents to make jumping to your needed spot SO easy! 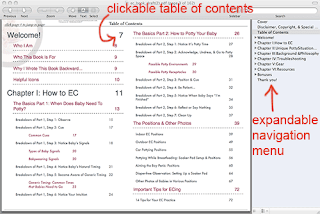 Searching for a topic is a cinch, and you can jump around within the book via textual links. In this instance, an eBook suits the purpose wonderfully. Andrea has taken a practice which before only dedicated, stay-at-home moms could get right, and turned it into an easy to use system for everybody! multiple Unique Potty Situation how-to’s (while breastfeeding, in nature, in the city, or traveling). With this package you will receive access to the book-owners’ website, where tons more information such as a sample letter to alternate caregivers, logs to determine your baby’s timing and signals, and more, are waiting for you. I have enjoyed this journey so much, and only wish that I had started earlier with my son. It has been a fantastic experience, learning to trust that my son does, in fact, have control over his body. My son is happier and more confident because of it. He is just as excited as we are to wake up dry and have that first wee of the morning outside. After reading this book, you will wonder why everyone doesn’t practice EC! 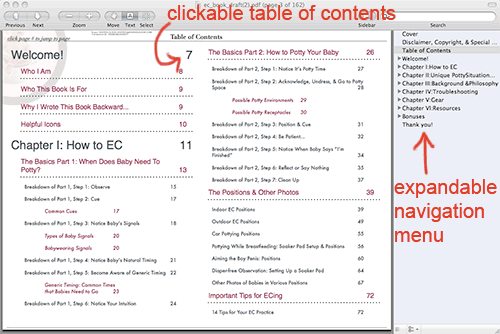 You can purchase your own EC Simplified: Infant Potty Made Easy Plus Package at EC Simplified. The EC Simplified basic package can be bought for $37, and the plus package can be bought for $47. The Basic Package includes the book, access to the private EC Support Forum, a 25 video library, and a collection of tools to get you started on the right foot. The Plus Package includes everything found in The Basic Package (the book, access to the private EC Support Forum, a 25 video library, and a collection of tools to get you started on the right foot) PLUS it includes the Audiobook Version! And just for Natural Parents Network and African Babies Don’t Cry readers, Andrea is giving a 30% discount on all orders! Enter code NPN30 during the ordering process. For your own chance to win a EC Simplified: Infant Potty Made Easy Plus Package from EC Simplified, enter by leaving a comment and using our Rafflecopter system below. The winner will receive the plus package. Contest is open WORLDWIDE. MANDATORY ENTRY:Visit EC Simplified and tell us one thing you have learned about the company! You must enter your name and email address in the Rafflecopter entry system for your entry to count, after leaving a comment on this blog post. This is a joint giveaway with African Babies Don’t Cry and Natural Parents Network. You may enter at one site only, and we’ll be recording IP addresses to ensure that there are no duplicate entries. That said, please do visit and enjoy both sites! Contest closes 19 January 2013 at 11:59 p.m. Eastern Time. Christine is a teacher turned work-at-home mom to her beautiful son, Jesse. She lives in South Africa and is passionate about bringing up her son as naturally as possible. Christine blogs at African Babies Don’t Cry where she often writes about natural nutrition and toddler health. She keeps busy by volunteering for the Natural Parents Network, being an avid gardener and a healer in training. You can also find her on Facebook. EC will take too long and is not age-appropriate for babies over 18 months. My children are over potty training age but I remember the tears and frustration of potty training. If I had used EC, I feel sure that there would have been so much more peace in our house. My sister and cousin have recently had babies and I’d like to introduce them to EC to save them the frustration we went through. Go ahead and sign up for the EC newsletter – it’s packed full of information and tips and no spam! I would love get more information on ec! I learned that she is planning to do a DOCUMENTARY! I flipping LOVE documentaries! I did part-time EC with my son when he was young…. he took to it beautifully! We’ve tried with our daughter but she just seems frustrated by it, which frustrates US. But she has SUCH sensitive skin… even if we were only doing part-time EC again, I KNOW she’d benefit loads. I learned you can start training as a newborn! I am interested because I have a 4 month old. I learned that she’s a DiaperFreeBaby mentor near me!! The ideal starting period for EC is 0-4 months? Wow! The best time to start I early — small infant (0-4months). I had no idea. Even if you don’t start in that 0-4 month window, it is still possible to EC a child between 5-18 months. I have been interested in it for years, since I was pregnant with my oldest child. My daughter is 16 months and showing a great awareness of the potty and her bladder functions. I would love to learn more tips on what I can do to better understand her signs of going and how to facilitate actually using the potty. I learned that the owner, Andrea is a DiaperFreeBaby mentor! I’m interested in EC because we have done it “part time” with our daughter, but don’t seem to be getting to the final stage! i learned that the author has a master’s in psych! DD is potty trained during the day, but i’d love to learn about nighttime!